What has a diverse population, the Metro Rail, Bus way, M-Path, and is green all over? Downtown Dadeland! Well, except for that last part. This intersection of many types of transportation options mean that this is a great gathering place for people coming from many diverse places by a multitude of means. Dadeland resident and urban planner Eric Katz believes that the only thing missing from this is open green space. 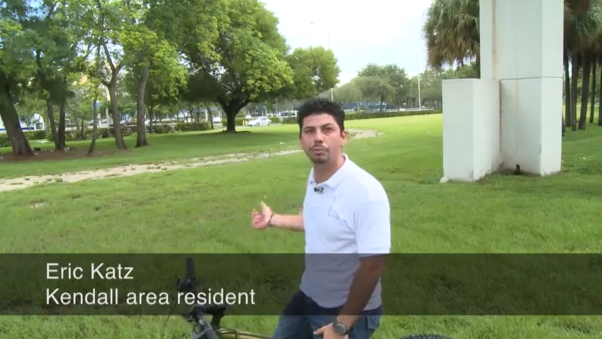 Eric’s big idea is to create an M-Path Park in this Southwest Miami metropolitan hub that is convenient and safe for transit users, joggers, residents, cyclists who can all enjoy the benefits of a local open space. Imagine the possibilities! You could take the train home from work and walk through nature to unwind on your way home, take the bus home from an outdoor concert in the park, or overachieving downtown Miami residents could bike down the M-Path, swinging in to a local grocery store to pick up a picnic lunch for Dadeland’s urban oasis. Help Eric and his team to build a grassroots community led project to create momentum for this park. Donate now, and be generous: your gift is an investment in a greater Miami.